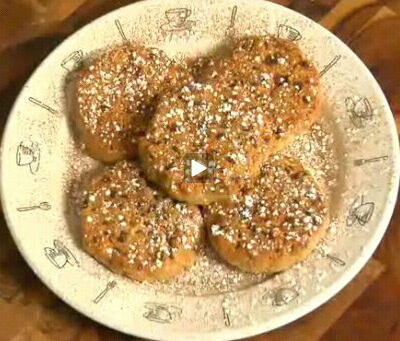 Like cinnamon toast... tucked into biscotti! 1. Preheat oven to 350°F. Lightly grease (or line with parchment) a large baking sheet. 2. 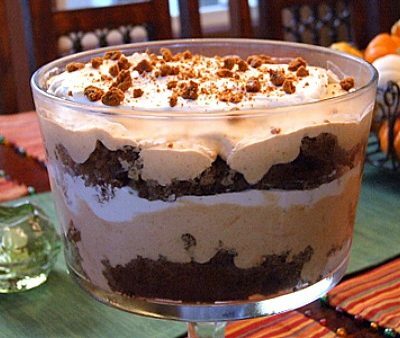 In a medium- sized bowl, beat butter, sugar, salt, vanilla and baking powder until the mixture is smooth and creamy. Beat in eggs; the batter may look slightly curdled. Lower the mixer speed, add the flour, cinnamon, chips and nuts (if using). Mix until smooth. The dough will be quite soft and sticky, but should hold its shape when you drop it from a spoon. 3. Transfer the dough to the prepared baking sheet, shaping it into a rough log about 14 inches long, 2 1/2-inches wide and 3/4-inch thick. 4. Bake for 25 minutes. Remove from oven and let cool on the pan anywhere from 5 to 25 minutes; just work it into the schedule of whatever else you're doing in the kitchen. Five minutes before cutting, use a spray bottle filled with room temperature water to lightly but thoroughly spritz the log, making sure to cover the sides as well as the top. Softening the crust just this little bit will make slicing the biscotti much easier. 5. Reduce the oven temperature to 325°F. Wait another 5 minutes, then cut the biscotti into 3/4-inch slices. Be sure to cut straight up and down. If you cut at an angle, the biscotti may be thicker at the top than the bottom, and they'll topple over during their second bake. 6. Set the biscotti upright on the prepared baking sheet. Bake for 25 minutes. Remove from oven and transfer them to a rack to cool. *Cinnamon chips are available at some grocery stores next to the chocolate chips. Hershey's makes them. *Store the biscotti in an airtight container, to preserve their texture. If they aren't as crunchy as you'd like (and the weather is dry), store them uncovered, overnight, to continue drying. Biscotti can be stored at room temperature for 1 week; for longer storage, wrap airtight and freeze. 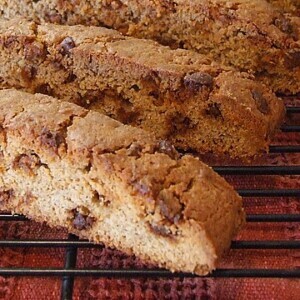 Growing up Italian we had biscotti all the time! 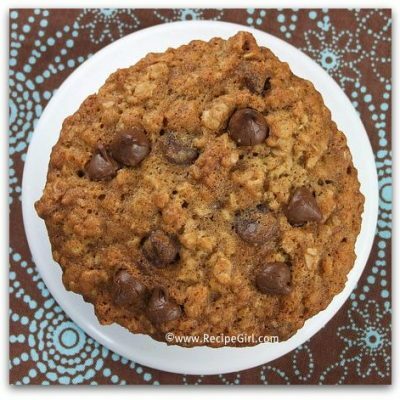 So I saw this recipe had no comments and I thought that was sad as this recipe is amazing!! 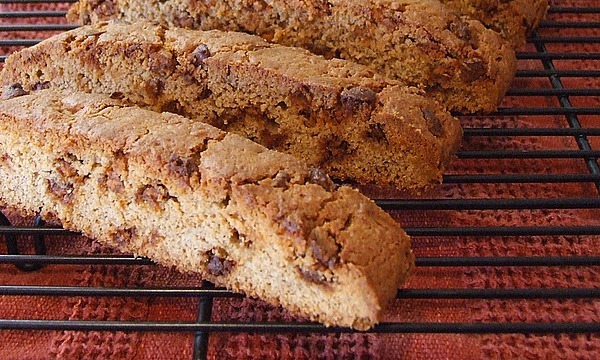 I can not tell you how many people (before trying this of course) have said “Biscotti? O no I don’t like biscotti…” So far no one has turned down a second one! I really enjoy changing peoples minds about certain foods they think they do not like. 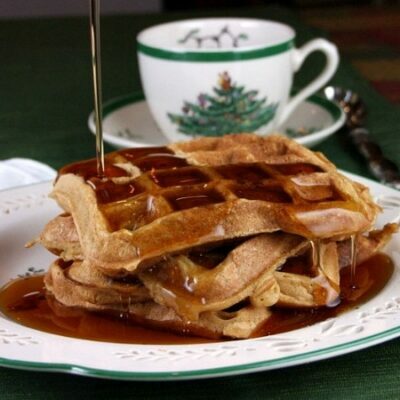 I also tried putting butterscotch chips in instead of cinnamon and it was great!